Special masses and prayer sessions were held in the city today on the occasion of Mother Teresa's 108th birth anniversary. 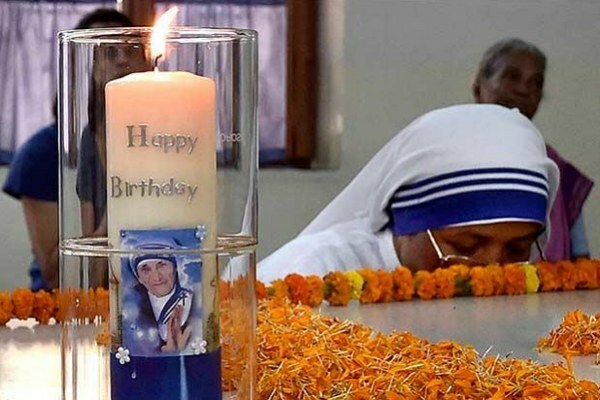 Nuns offer prayers during the 108th birth anniversary celebration of Mother Teresa Kolkata: At the Mother House, the global headquarters of Missionaries of Charity (MoC), nuns and shelter home inmates, along with general public, lit candles and offered prayers to the patron saint of Kolkata this morning. The Vatican had declared Mother Teresa 'Patron Saint' of the 'Archdiocese of Calcutta' on September 6, last year, in recognition of her selfless service towards helping the poor and the underprivileged in the city. The honour came a year after Pope Francis had proclaimed her 'Saint' at a canonization mass. Sunita Kumar, a spokesperson of MoC, urged people to follow Mother's ideals in everyday life. "She will forever live in our hearts... We should all take a pledge to follow her path and work for the poor and the helpless," Kumar told PTI. A large number of people also gathered at the Archbishop House, around 1km from the Mother House, to offer floral tributes to a life-size bronze statue of Saint Teresa. The statue, designed by Church Art, was donated in 2016 to mark a symbolic link between Kolkata and Macedonia's capital Skopje, where she was born. Archbishop Reverend Thomas D'Souza, who shares his birthday with Mother, cut a cake on the occasion in the presence of Honorary Consul of the Republic of Macedonia in Kolkata, Namit Bajoria. Mother Teresa was born on August 26, 1910 at Skopje. She died on September 5, 1997, less than a month after her 86th birthday. She was the recipient of numerous honours, including the Nobel Peace Prize in 1979 and the Bharat Ratna in 1980. In 2003, she was beatified as 'Blessed Teresa of Calcutta'.